I only have one tank now,a few seahorses and a Queen, I upgraded my lights, 2 Kessil's this video shows the Queen, I bleached one Acropora, when i dumped 40 gallons of fresh water into a 400 gallon system "mistake" so ordered auto aqua smart, welcome all advice sps coral is new for me. 2 things to note before you get any more acros. That queen angel will probably eat almost every coral you put in the tank. Sps need higher flow which will not be good for your seahorses. Seahorses love high water flow, they hang out on the the Maxspect XF 150 and sometimes take rides across the tank swim back and do it again, without strong water flow they may get sick! John Cobb,s tank is filled with Coral and angel,s is it not, any way 2 corals bleached since seahorses could care less about salinity I got sloppy, I need advice and will make every mistake. The lights are 2 Kessil A360WE water only 20" deep Tank 8" long. high flow, high light, and constant water parameters. Your 2 kessils are not enough night for Acros. At there highest level those kessils are putting out 300-350 just under the water level at max level. I strongly recommend halides or T5's. 2x 400w halides would cover that whole tank. As for flow your single maxspec 150 wont cut it for acros you will probably need 1-2 more. Acro flow IMO is not suitable for seahorses. and for constant water parameters, do you have a plan to keep your water consistent? so what can i grow with what i have? I have a brown montipora that grows like crazy but its not to Architectural I am going to give my star coral and leather coral to my brother ugh, it would be kind of you to give me a short list of what i can grow, not into soft coral , oh better change the name of this topic too. Look into lps and the basic sps like birdsnest, pocilipora,and monties. I'd second the recommendation for pocillipora and montipora. Monti digitata will give you more of the branching look I think you want, but tend to be fragile, at least in my experience. I've personally never had good luck with birdsnest corals, but that could just be me. Heliopora would be another possibility, and there's a SWAP thread for that. Having said that, I think it is/would be a mistake to try to keep horseshoe crabs with any of these. Their respective temperature requirements aren't really compatible, as the horseshoe crabs like significantly cooler water. 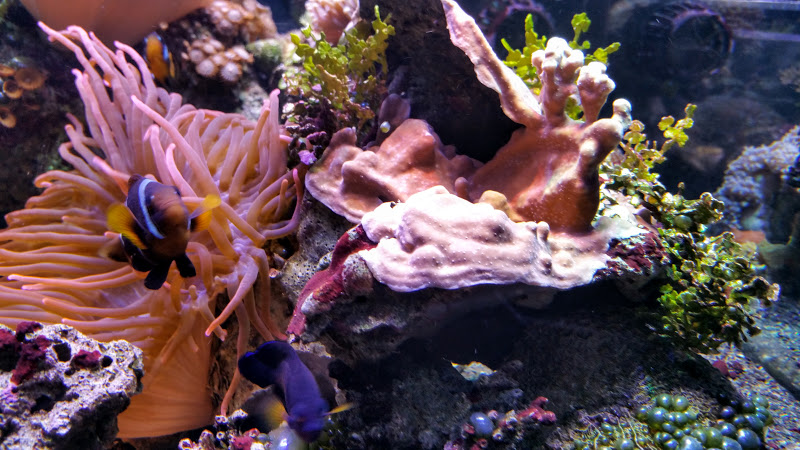 If you try to keep both horseshoes and these corals in the same tank one or the other -- or both -- are going to be stressed and unhappy. What about heliopora? I'm not sure if it would be ok for seahorses, but it grows plating and branching and seems like it would be a good hitching post for them. Grows in pretty much anything and doesn't seem to care about anything I've ever done to it (I've even drastically dropped salinity in it's tank before). Heliopora is what I was referring to, not hydnophora; it isn't stinging or aggressive, other than fast growing. Walt, that is a beautiful little queen angel. I don't follow "Game of Thrones", so I'm probably the only person in Western Civilization that doesn't know who queen khaleesi is. I grew acropora with a Kessil.... You can do it too Walt. Hope you did not put the horseshoe crabs back into the Bay. You have exposed them to multiple foreign pathogens in your tank and introducing these to the Bay could have adverse reactions. It does not seem like much, but it's certainly an important ecological rule to stand by that you should not reintroduce animals that have lived in captivity to the wild if they have been exposed to potentially alien pathogens. This is one of the big reasons why VDGIF says that animals in captivity beyond a set time cannot be released back into the wild.